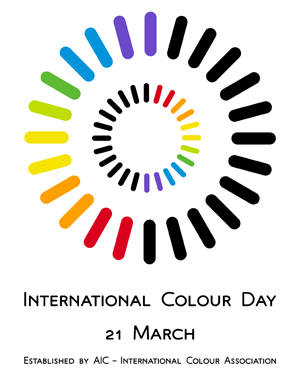 The International Colour Association [AIC] has declared March 21st International Day of Colour. March 21st every year is the “equinox” – aequus (equal) and nox (night). Around the equinox, the night and day are approximately equally long, symbolically relating to the complementary nature of light and darkness, light and shadow expressed in all human cultures. An International Day of Colour has been considered as appropriate since colour is, thanks to visual perception, one of the most influential phenomena in people’s lives and also one of the channels that contributes most greatly to the perception of reality. All around the world memorable colour activities are increasingly being developed during the International Day of Colour.